Business Process Management has been referred to as a holistic management approach to aligning an organisations business processes with the wants and needs of clients. BPM uses a systematic approach in an attempt to continuously improve business effectiveness and efficiency while striving for innovation, flexibility, and integration with technology. Business Process Outsourcing is typically categorised into back office outsourcing – which includes internal business functions such as human resources or finance and accounting, and front office outsourcing – which includes customer-related services such as contact center services. A term used in many business arenas referring to the beginning and end points of a method or service. End-to-end theory embraces the philosophy that eliminating as many middle layers or steps as possible will optimise performance and efficiency in any process. An example of end-to-end processes include directly connecting buyers and sellers in the eCommerce arena or in manufacturing. This occurs when one company provides a service to another in which it manages all aspects of design and production of a particular product – end product directly to end user. End-to-end processing refers to co-ordination in performing a sequence of defined steps, also known as processes, to achieve business objectives, from the beginning to the end. Computer-to-computer – EDI replaces postal mail, fax and email. While email is also an electronic approach, the documents exchanged via email must still be handled by people rather than computers. Having people involved slows down the processing of the documents and also introduces errors. Instead, EDI documents can flow straight through to the appropriate application on the receiver’s computer (e.g. the Order Management System) and processing can begin immediately. Business documents – These are any of the documents that are typically exchanged between businesses. The most common documents exchanged via EDI are purchase orders, invoices and advance ship notices. But there are many, many others such as bill of lading, customs documents, inventory documents and shipping status documents. Standard format – Because EDI documents must be processed by computers rather than humans, a standard format must be used, so that the computer will be able to read and understand the documents. A standard format describes what each piece of information is and in what format (e.g. integer, decimal, mm/dd/yy). Without a standard format, each company would send documents using its company-specific format and, much as an English-speaking person probably doesn’t understand Japanese, the receiver’s computer system doesn’t understand the company-specific format of the sender’s format. There are several EDI standards in use today, including ANSI, EDIFACT, TRADACOMS and XML. and, for each standard there are many different versions, e.g. ANSI 5010 or EDIFACT version D12, Release A. When two businesses decide to exchange EDI documents, they must agree on the specific EDI standard and version. Businesses typically use an EDI translator – either as in-house software or via an EDI service provider – to translate the EDI format, so the data can be used by their internal applications and thus enable straight through processing of documents. Business partners – The exchange of EDI documents is typically between two different companies, referred to as business partners or trading partners. For example, Company A. may buy goods from Company B. Company A. sends orders to Company B. Company A. and Company B. are business partners. Depending on where you are in the invoicing process, companies will have a different perspective of electronic invoicing and the potential benefits. Buyers may wish to be able to pay quickly in order to take advantage of any early payment discounts available. This process is known as the ‘procure-to-pay cycle’. For suppliers, the quicker the invoice can be processed the faster they can be paid for providing their product or service. 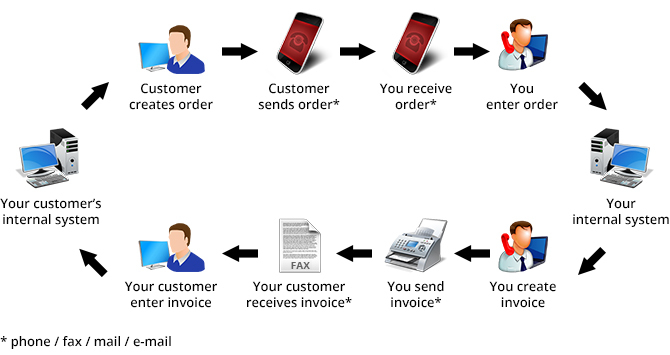 This process is known as the ‘order-to-cash cycle’. Having fewer lost or missing invoices. Reducing FTE (Full Time Employee) and processing costs. Public notaries in Poland are persons of trust, who prepare official documents and offer their clients the guarantee of an authenticated document. Public notaries in Poland are a leading legal category with numerous responsibilities, such as informing, creating documents or making deposits. There are almost 1,300 notary offices and more than 1,500 public notaries in Poland. Public notaries in Poland are appointed by the Minister of Justice, after consulting with the local notarial chamber. The regional notarial chambers are under the law of the Court of Appeals and they form the National Chamber of Notaries. The Warsaw Chamber of Civil Law Notaries is the highest of the local associations and works as a centre for decision-making, a meeting place and a regulating body. There is also a Council Chamber that is responsible for all decisions and controls of offices. The president of the local Council Chamber is elected for a period of three years. The requirements for becoming a public notary in Poland involve nationality and education. A person who wants to be a Polish notary must have Polish citizenship and must be of impeccable character. A candidate for public notary in Poland is eligible if he is older than 26 and holds a ‘Master of Arts’ degree in law studies at a university in Poland, or at a foreign university recognised in Poland. There is also the necessity of a period of training and a three-year job as an assistant notary in Poland. For instance, the Warsaw Chamber of Notaries conducts training groups for applicants who want to become public notaries in Poland. Nevertheless, a future public notary in Poland must pass the notarial examination. There is also a special category of professional experts who may be appointed as public notaries in Poland, such as professors of legal science, judges, prosecutors, advocates or legal advisers. The main duty of a public notary in Poland is to notarise documents in order to certify the validation of the contract according to the law. This happens only if the two parties sign the papers in the presence of a Polish public notary. Other services offered by a public notary in Poland include drafting notarial deeds, preparing protests relating to promissory notes, accepting deposits and receiving declarations regarding inheritance. A classification used by financial institutions that refer to loans that are in jeopardy of default. Once the borrower has failed to make interest or principal payments for 90 days the loan is considered to be a non-performing asset. Also known as a ‘non-performing loan’. payment is recorded in general ledger. Procure-to-pay, often abbreviated to P2P, refers to the business processes that cover activities of requesting (requisitioning), purchasing, receiving, paying for and accounting for goods and services. Procure-to-pay is synonymous with other terms such as ‘purchase-to-pay’ and ‘order-to-cash’. Depending on the context, these phrase can be used to describe either buy side or sell side process and some vendors have adopted these terms as brands for their ERP modules. Procure-to-pay (P2P) is often associated directly with the technology that support the processes it describes like e-procurement and ERP purchasing and payment modules. As its name implies, a procure-to-pay system is a fully integrated solution designed to support an end-to-end process that begins with goods and services requisitioning and ends with ready-to-pay files for upload into an accounts payable system. Procure-to-pay solutions use a scan-and-capture service, supplier portal and/or a platform to enable suppliers to submit invoices electronically. A power of attorney in Poland is defined as an agreement completed in a written form with notarised signatures. The Polish law mentions that an original power of attorney in Poland must be signed by the applicant or if the grantor is a company, by an authorised representative. A power of attorney in Poland authorises a person to act on behalf of another individual. Actually, Polish Civil Law makes a difference between statutory representation based on statutory law and a power of attorney based on a notarised declaration. The Polish Civil Code stipulates that a general power of attorney in Poland offers authorisation for acts of ordinary management. Whatever is beyond ordinary management requires a special power of attorney in Poland. This is the case of a specific power of attorney in Poland, which empowers one person to perform legal in only one category specified in the document. An ordinary power of attorney in Poland is different from a commercial power of attorney in Poland, also known as a proxy or prokura. Legal entities can be represented by proxy holders under a power of attorney, which entitles an individual to act on behalf of the company. This special type of power of attorney in Poland can only be given by entities registered with the National Court Register or a company that is about to register. A person with a special power of attorney in Poland can represent the company before courts, state and local administrative bodies. However, the Polish Civil Code regulates and limits the activities that a proxy holder is entitled to perform. Capital companies have to obtain the consent of all members of management board before giving power of attorney in Poland. Even more, in partnership entities, all partners have to agree upon the person who is given a power of attorney in Poland. A power of attorney in Poland can be revoked at any time by the person or entity who gave it. If the attorney wants to quit the deal and transfer it to another person, the Polish Code of Obligations states that it is impossible, since the power of attorney in Poland is given based in a relation of trust, therefore, the attorney cannot be substituted unless the grantor agrees. generating user-defined financial and management reports. In general the Record-to-Report function is not engaged in processing transactions, but rather the aggregation of existing data in computer systems to enable meaningful performance reporting to be prepared for management. However, the R2R function may be a part of a broader accounting department. Record-to-Report, as an end-to-end F&A process that includes both transaction-intensive (rules based) activities and judgment-intensive (cognitive) activities, Record-to-Report (R2R) represents a significant part of business operations. Typically, it accounts for one third of the overall F&A function cost. Nearly approx. 60% of R2R costs are comprised of transaction-intensive processes, which make outsourcing R2R a very attractive option, especially around reconciliations, journal entries, closing, consolidations and reporting.